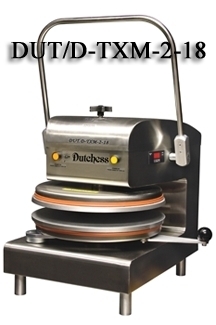 DUT/TXM-2-18 Manual Pizza & Tortilla Dough Press -- Dutchess Bakers Machinery Co. Inc. The Model DUT/D-TXM-2-18 manual stainless steel Tortilla & Pizza Press is the most efficient, durable and easiest way to press Tortillas or Pizza dough. With the large 18" dual heated platens you can press, flatten or par bake 4-6 Tortillas in seconds. Pizza dough can be cold pressed, warm pressed or par baked in just a few seconds. The lightweight bottom platen easily swings out to allow quick loading and unloading product. Heat one or both platens to 450°F or use it	without heat for cold pressing. Easy to use Cam over-lock linkage reduces operator fatigue. Sleek, Modern Durable and easy to clean	all Stainless Steel design. 220 volt, 4000 watts, 20 amps. 22-1/2" wide x 31-3/8" high x 37-7/8" deep.